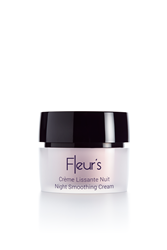 A comforting nighttime cream to plump and smooth the skin with Smoothing Floral Bouquet and encapsulated hyaluronic acid. Directions for use: Apply in the evening to the face and neck after cleansing. Encapsulated Hyaluronic Acid - high molecular weight hyaluronic acid encapsulated in spherical particles for gradual, extended release. Penetrates to sub-layers of skin and plumps on contact with water, smoothing lines and wrinkles and filling hollow areas from within. *Satisfaction test on 24 volunteer aged between 45 and 65 years, with fine lines and wrinkles, lack of firmness and a dull complexion. Application of Night Smoothing Cream in the evening for 28 days.